No crazy theme this week, just some graphic novels that I think you should know about! 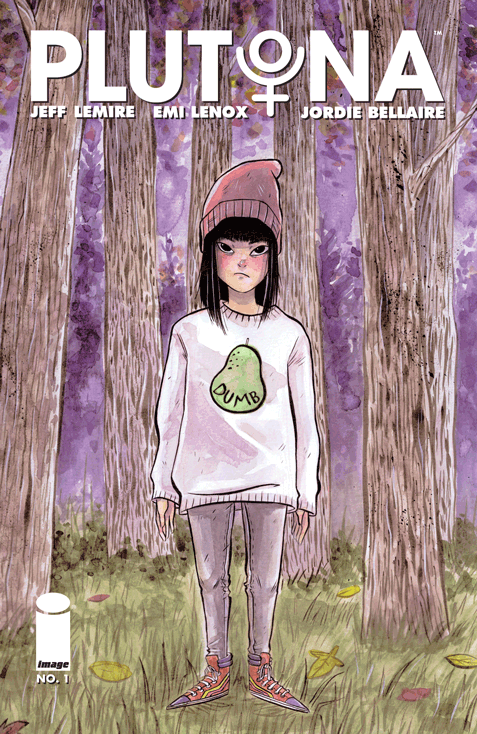 And today, I’m proud to bring you a review done by one of the students in my graphic novel class: Tatyanna T.
I’ve just finished reading the graphic novel Plutona, by Emi Lenox and Jeff Lemire. A mixture of superhero comic with a character-driven plot. If that is the type of genre you like, give this book a try! 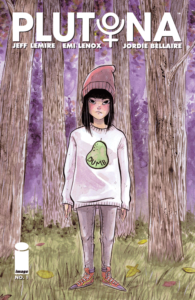 Plutona is about five suburban kids: Mie, Diane, Teddy, Mike and Ray, in Metro City who explore the woods one day after school to find the world’s greatest superhero, Plutona, dead. Mie is a confident child who is friends with Diane but slowly becomes distant as she grows a bond with Ray instead. Diane is a slightly overweight girl with a low self-esteem who is looked up to by Mie. However, she also grows some distance away from her as she hangs out more with Ray. Ray is an adventurous child with an irresponsible father who is drunk most of the day. He frequently has to wake up his father for work in the morning. Teddy is a curious child who is a cape spotter. He watches the skies after school and runs a cape spotting blog to catalogue all sightings of superheroes. At the scene where Mie was supposed to watch her younger brother, Mike, she loses sight of him and runs into the woods where they all find Plutona’s body. Mike comes along with the gang who decides to bury her and keep her death a secret to keep the town safe. As the story progresses, Teddy seems to be the most interested in Plutona. He decides he will cut her fingers and his in order to infuse all of her powers into him so he can be the new superhero of Metro City. Sadly, I do not have a favorite character in Plutona. Each character has something the reader, mostly teenagers, can connect to. Throughout the graphic novel, each character has experienced a coming of age lesson of some sort. Lemire and Lenox are very creative graphic novelists; Lemire is responsible for the writing and Lenox is responsible for the art of the graphic novel, and the art is simply gorgeous. The character designs have a very classic style with a true childhood aesthetic. It is also rich in color, thanks to Jordie Bellaire. However, the ending, I expected a bit more. It felt kind of rushed and I wished there were a book #2 but despite that, Plutona has an interesting plot with a nostalgic feel to it. I would rank this book in the 13+ category because the dialogue is that of a typical pre-teen and has minor violence. I’d categorize this book as a fantasy/drama because of a superhero named Plutona and the way each character shapes their relationships and identities in various ways. This book is very fun and kept me wanting more, and it still does! I’d like to thank Tatyanna for her thoughtful review! Plutona is a very interesting journey that I hope you decide to take with a push from an inspired student in my graphic novel class.